You might want to check out the cross-platform software program Words if you are currently preparing for GRE, GMAT or SAT tests or any other kind of test that involves the English vocabulary. Words is a portable software written in Java that can be executed on all major operating systems providing that Java is installed on them. 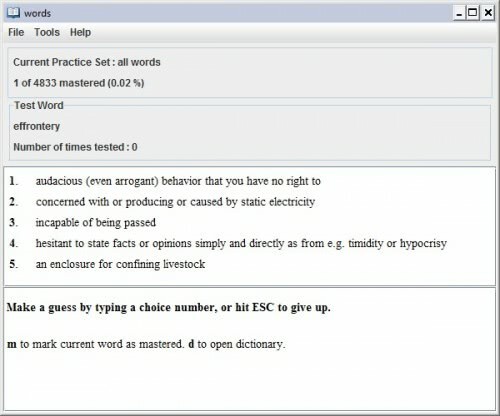 Words offers a basic multiple choice test that is using a dictionary of more than 4800 English words, their true definition and four false ones. The program will display on word and five definitions at a time. The user selects an answer with the 1-5 keys on the keyboard. It is also possible to press ESC to see the result. Pressing ESC will count as a wrong answer on the other hand. Words will then let the user know about the correctness of the answer. The program will furthermore display the pronunciation of the word, its meaning(s),synonyms and links to the definition at dict.org. The m key on the keyword will add the word to the list of words that have been mastered by the current user while the enter key will display the next word that has not been mastered yet. All words in the database will be tested by default. This can be changed in the program's options to only test words that are starting with a specific letter or fall into one of several categories. Words is a good program for users who want to prep for GRE, GMAT or SAT tests and those who want to improve their English vocabulary. I think it would be useful. Thanks! A good website for the GMAT in particular is Magoosh.